San Diego is a prime destination for an epic 4th of July celebration, so break out the barbecue and get ready for the sky to light up, as no matter what part of America's Finest City you reside, there is somewhere to relax and enjoy an amazing fireworks show. Here, we run down the top 18 Independence Day spectaculars taking place around San Diego County for 2018. Even though 4th of July falls on a Wednesday this year, San Diego is not holding back. Below are our top picks from the many fireworks shows around the county for 2018. 2. SeaWorld Fireworks, 9:45pm - Once upon a time, SeaWorld San Diego lit up the sky on most nights during the summer, but its Independence Day fireworks have always been extra explosive. Grab a spot on the sand along Mission Bay for this one. It usually takes place right after the Big Bay Boom ends so you can enjoy two-for-one. SeaWorld will also be performing a fireworks show on July 5-7. 3. Ocean Beach Pier Fireworks, 9pm - Enjoy a day of all that Ocean Beach has to offer, then cozy up as the sun sets for a spectacular fireworks show launched from the end of the OB Pier. Be careful, because there is usually a giant marshmallow melee around the same time as the fireworks, although that has subdued in recent years. Don't forget your radio so you can hear the fireworks soundtrack being broadcast simultaneously during the show. Tune in to KyXy 96.5 to hear the broadcast! 4. San Diego County Fair 4th of July Celebration, 9pm - Head to Del Mar Fairgrounds for the last day of the 2018 San Diego County Fair and enjoy one of our area's top fireworks shows. What better place is there to spend Independence Day than at the San Diego County Fair? Highlighting the day will be the traditional fireworks display, which will be visible throughout the Fairgrounds. 5. 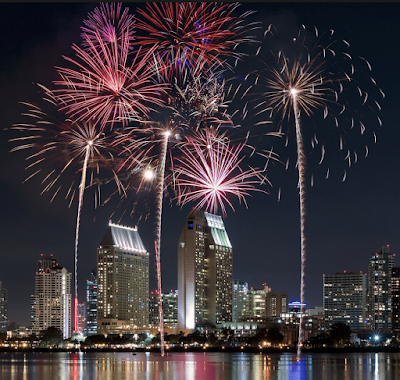 4th of July Celebration in Coronado, 9pm - Coronado's 4th of July celebration offers a full day of activities, starting with a parade down Orange Avenue at 10am, followed by a concert in Spreckels Park at 4pm, with the fireworks over Glorietta Bay starting at 9pm. The traffic is going to be heavy for this one, so consider taking the ferry over from downtown San Diego to Coronado. 6. Mira Mesa Fourth of July Celebration, 9pm - Head to Mira Mesa Community Park at Mira Mesa Boulevard and New Salem Street in Mira Mesa for festive, family friendly activities including a parade and 600-shell fireworks show. This 44 year tradition begins with a pancake breakfast at the Mira Mesa Senior Center. Family Fun Day in the Park opens at 11am with food vendors and entertainment. The annual 4th of July Parade steps off at 11:30am, with Family Fun Day continuing until 9pm when the fireworks begin. 7. Escondido Independence Day Festival & Fireworks, 9pm - Taking place at the California Center for the Arts in Escondido, join more than 25,000 festival-goers for the 55th annual Independence Day Festival & Fireworks display with live music, food, children's activities, games, and, of course, fireworks. This free community event features live music, pro-wrestling matches, and a National Anthem Singing Competition. 8. El Cajon 4th of July Picnic & Fireworks, 9pm - El Cajon's 4th of July celebration takes over Kennedy Park at 1675 East Madison Avenue from 1-9:30pm. Picnic at the park and enjoy sunny San Diego East County, with food, games, prizes, kiddie train rides and more. 9. Red, White and BOOM! at Legoland California, 8:30pm - Bring the entire family and spend the day enjoying over 60 rides, shows and attractions, as well as some all-American picnic games like burlap races, water-balloon tosses, the Family Build Challenge and Lego Hamburger relay. Finish the day with an awe-inspiring fireworks display set to patriotic music. 10. Chula Vista 4th Fest, 9pm - Enjoy free July 4th fireworks at the Chula Vista Elite Athlete Training Center (previously the U.S. Olympic Training Center), set to a custom soundtrack heard only on 91X, Magic 92.5, Z90.3, KFM-BFM 100.7, and AM760. Gates open at 6pm for public viewing. No alcohol is allowed on the USOTC campus and vehicles and pedestrians will be searched upon entry. Parking is $10 with only 400 parking spots. There is also free parking along Olympic Parkway and Lake Crest Drive. 11. Poway's An Old Fashioned Fourth of July & Fireworks, 9pm - Head to Old Poway Park and celebrate the country’s independence "turn-of-the-20th-century-style". This all-day event will feature patriotic entertainment, gun fighting re-enactments, free crafts, train displays, and old-fashioned games. Tasty treats and train rides will be available for a nominal fee. Then as the sun sets, get ready to enjoy spectacular fireworks as they light up the sky over Lake Poway High School Stadium with a $5 entrance fee. Games, activities, and a DJ spinning the tunes round out the fun. 12. Vista Independence Day Celebration, 9pm - Taking place at Moonlight Amphitheatre in Brengle Terrace Park, the annual celebration includes a Light Up The Night Dinner, a military heroes salue and a live performance from the Mar Dels, followed by a fireworks show. Parking in Brengle Terrace Park is $15 per car, and $30 per recreational vehicle. Admission to the Moonlight Amphitheatre is $5 per person. Children five and under, active and retired military and their immediate family receive free admission to the Moonlight Amphitheatre. 13. Santee Salutes 4th of July Celebration, 9pm - An all-day event with live music by the 80z All Stars, a patriotic ceremony, a food garden and a kid's fun zone will end with a firework show. The event takes place at Town Center Community Park from 2:30-10pm and parking is $5 per car with no in and out privileges. 14. Rancho Bernardo's The Spirit of the 4th, 9pm - After an entire day of fun at the community fair at Webb Park in Rancho Bernardo, end the holiday with fireworks at the Athletic Field of Bernardo Heights Middle School at 12990 Paseo Lucido. Rancho Bernardo's lavish fireworks display, "Sky Concert" produced by PYRO Spectaculars, ends with a Grand Finale display of nearly 400 high altitude shells. 15. Imperial Beach Independence Day Fireworks, 9pm - Gather your friends and family, bring a picnic or grab a snack from neighboring businesses, then spread your beach blanket early to claim some space and catch all the action at the IB Pier. Be sure to tune into KyXy Radio 96.5 FM for a synched music playlist set to the fireworks show. 16. San Marcos Fireworks Extravaganza, 9pm - Head to Bradley Park in San Marcos and enjoy a concert by Liquid Blue starting at 6pm, followed by a riveting fireworks spectacular. There will also be carnival games, jumpers and food for sale on site. 17. Independence Festival at the Border, July 1 @ 9pm - Starting at 3pm, enjoy the 5th annual Independence Day at the Border Festival in San Ysidro complete with family activities, live music, dance, drinks, food and fireworks. Taking place at Larsen Field at Cesar Chavez Park, admission is free and open to all ages. 18. Oceanside's 130th Anniversary & Independence Fireworks Show, July 3 @ 9pm - Taking place at El Corazon Site at Rancho del Oro Road, this celebration includes music, food trucks and a booming fireworks show. Bring a beach chair! On the morning after 4th of July - Thursday, July 5, there will be a big mess to clean up, and the Surfrider Foundation San Diego County Chapter will be leading the cleanup efforts! Join in on Surfrider's Morning After Mess Cleanup from 9am to 12pm at one of the four hosted locations - Ocean Beach Pier, Oceanside Pier, Fiesta Island and Crystal Pier. Check out the below map for a huge list of all the 2018 4th of July celebrations taking place around San Diego County, thanks to fine folks at SanDiego.org. Have a great holiday and be safe out there!